All over the world people are experiencing record high temperatures this July, but you couldn’t tell it looking at these healthy plant specimens. 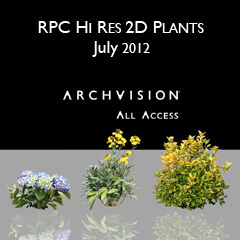 Liven up your Summer’s renderings with these (3) beautiful RPC shrubs and flowers. The July 2012 plants additions collection features a shimmering blue Big Leaf Hydrangea, the dainty yellow Flowering Shrub  (perfect for a butterfly garden) and Shrub  that would complement just about any landscaping project. ArchVision Software License (Both Node-Lock and Floating License) customers now have access to these new hi-res RPCs and thousands more.